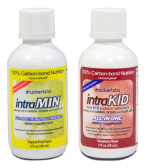 intraMAX Travel Size package is a convenient way of bringing your intraMAX to work or on short trips. It contains six 2-ounce (57ml) bottles. intraMAX, 57ml, travel size is a convenient way of bringing your intraMAX to work or on short trips. 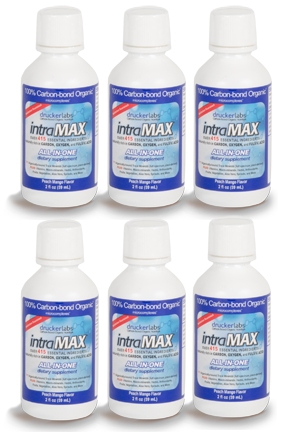 intraMAX™ contains 100% Organic microcomplexed™ intraCELL™ Level V Technology. The 415+ ultra-chelated (ultra tiny) nutrients are wrapped in carbon and mixed with oxygen to mimic the body’s natural makeup. 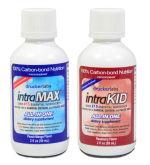 This increases the absorption of these essential nutrients to near 100%. 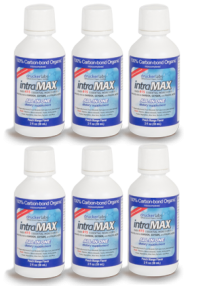 intraMAX™ also contains natural fulvic acid, which is a product of nature’s life cycle that contains elements from all living matter. It is now being shown that prominent modern diseases and health problems are dramatically and positively affected by supplementation or treatment with fulvic acid and other preparations enhanced or created with fulvic acid. How do I take intraMAX®?